HINT: COMPONENTS: SEE PAGE 30-4 Overhaul the RH side following the same procedures as for the LH side. HINT: Perform the procedure only when removing the RH side. (a) Remove the nut, and separate the stabilizer link assy LH. (a) Remove the bolt and clip, and separate the sensor wire and hose from the shock absorber. NOTICE: Be careful not to damage the speed sensor. (b) Remove the bolt, and separate the speed sensor front LH from the steering knuckle. NOTICE: Prevent foreign matter from adhering to the speed sensor. (a) Remove the bolt and 2 nuts, and separate the front suspension arm sub-assy lower No.1 LH from the lower ball joint. (a) Using SST, remove the front drive shaft assy LH. Be careful not to drop the drive shaft assy. (a) Using a screwdriver, remove the bearing bracket hole snap ring. (a) Remove the 2 bolts and pull out the drive shaft together with the center bearing bracket. (b) Remove the drive shaft assy RH. SST 09520-01010, 09520-24010 (09520-32040) HINT: Overhaul the RH side following the same procedures as for the LH side. When removing and installing the front drive shaft assy RH in a 4WD vehicle, be sure to first drain all the transaxle oil and transfer oil. If removal and installation is carried out without draining these oils, the transfer oil will flow into the transaxle side. Extensive cleaning will be required if the two oils mix. Do not damage the oil seal and dust cover. The hub bearing could be damaged if it is subjected to the vehicle's full weight, such as when moving the vehicle with the drive shaft removed. Therefore, if it is absolutely necessary to place the vehicle weight on the hub bearing, first support it with SST. (a) Omega Type: Using pliers, remove the inboard joint boot LH No.2 clamp, as shown in the illustration. (b) Claw Engagement Type: Using pliers, remove the inboard joint boot LH No.2 clamp, as shown in the illustration. (c) One Touch Type: Using a screwdriver, remove the inboard joint boot LH No.2 clamp, as shown in the illustration. (a) Remove the inboard joint boot LH clamp using the same procedures as for the inboard joint boot LH No.2 clamp. NOTICE: Do not use a punch for the marks. (c) Using a snap ring expander, remove the shaft snap ring. (e) Using a brass bar and hammer, remove the tripod joint from the outboard joint shaft. HINT: This procedure is unnecessary for a 3MZ-FE 4WD drive type vehicle (Front drive shaft RH) because it dose not have a drive shaft damper. (a) Omega Type: Using pliers, remove the drive shaft damper clamp, as shown in the illustration. 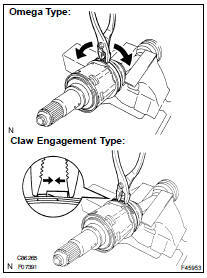 (b) Claw Engagement: Using needle-nose pliers, remove the drive shaft damper clamp, as shown in the illustration. (c) One Touch Type: Using a screwdriver, remove the drive shaft damper clamp, as shown in the illustration. (d) Remove the drive shaft damper. (a) Omega Type: Using pliers, remove the outboard joint boot LH No.2 clamp, as shown in the illustration. (b) One Touch Type: Using a screwdriver, remove the outboard joint boot LH No.2 clamp, as shown in the illustration. (a) Remove the outboard joint boot LH clamp using the same procedures as for the outboard joint boot LH No.2 clamp. (a) Using a screwdriver, remove the hole snap ring. (a) Using a press, remove the drive shaft dust cover RH. (a) Using SST and a press, remove the drive shaft dust cover RH. (a) Using SST and a press, remove the drive shaft dust cover. (a) Using a screwdriver, remove the bearing case snap ring. (a) Using a press, remove the bearing case snap ring. (b) Using SST and a press, remove the bearing. (c) Remove the bearing bracket hole snap ring. (a) Install a new bearing bracket hole snap ring to the front driver shaft assy RH. (b) Using SST and a steel plate, install a new front drive shaft bearing. NOTICE: Bearing should be completely installed. (c) Using a snap ring expander, install a new drive shaft hole snap ring. (a) Using SST and a press, install a new drive shaft dust cover. (a) Using SST and a press, install a new drive shaft bearing. (a) Using a screwdriver, install a new bearing case snap ring. (a) Using SST and a press, install the drive shaft bearing case to the inboard joint assy RH. NOTICE: Bearing should be installed completely. (a) Using SST and a press, install a new driver shaft dust cover. (a) Using SST and a press, install a new drive shaft dust cover RH until the distance from the tip of the center drive shaft to the drive shaft dust cover RH meets the specification, as shown in the illustration. (a) Using SST and a press, install a new drive shaft dust cover RH. (a) Using SST and a press, install a new drive shaft dust cover LH. HINT: Before installing the boots, wrap the spline of the drive shaft with vinyl tape to prevent the boots from being damaged. (b) Temporarily install a new outboard joint boot with 2 clamps to the drive shaft. (c) Pack the outboard joint shaft and boot with grease. (a) Omega Type: Secure the 2 outboard joint boot clamps onto the boot. (b) Place SST onto the outboard joint boot LH No.2 clamp. (c) Tighten the SST so that the outboard joint boot LH No.2 clamp is pinched. (d) Using SST, measure the clearance of the outboard joint boot LH No.2 clamp. (a) The procedure for the outboard joint boot LH clamp is the same as above. (a) Install the drive shaft damper LH to the drive shaft. (b) Make sure that the damper is on the shaft groove. (c) Set the distance, as described below. (a) Omega Type: Hold the front drive shaft lightly in a soft vise. (b) Install the drive shaft damper clamp to the damper. NOTICE: Be sure to install the clamp in the correct position. (c) Place SST onto the drive shaft damper clamp. (d) Tighten the SST so that the clamp is pinched. (e) Using SST, measure the clearance of the drive shaft damper clamp. (f) One Touch Type: Set a new damper clamp to the drive shaft damper RH and install the damper clamp with a screwdriver. (g) Claw Engagement Type: Set a new damper clamp to the drive shaft damper RH and install the damper clamp with needle-nose pliers. (a) Temporarily install a new inboard joint boot with 2 clamps to the drive shaft. (b) Place the beveled side of the tripod joint axial spline toward the outboard joint shaft. (d) Using a brass bar and hammer, tap in the tripod joint to the outboard joint shaft. (f) Pack the outboard joint shaft and boot with grease. (g) Align the matchmarks, install the inboard joint assy to the outboard joint shaft assy. (a) Install the inboard joint boot to the inboard joint assy. (a) Omega Type: Install new inboard joint boot clamps.
) Place SST onto the inboard joint boot LH No.2 clamp. Tighten the SST so that the inboard joint boot LH No.2 clamp is pinched. Using SST, measure the clearance of the inboard joint boot LH No.2 clamp. (b) Claw Engagement Type: Using pliers, install the inboard joint boot LH No.2 clamp, as shown in the illustration. (c) One Touch Type: Using a screwdriver, install the inboard joint boot LH No.2 clamp, as shown in the illustration. (a) Install the inboard joint boot LH clamp using the same procedures as for the inboard joint boot LH No.2 clamp. HINT: For dimension (A), refer to the following table. (a) Coat the spline of the inboard joint shaft assy with ATF. (b) Align the shaft splines and install the drive shaft assy with a brass bar and a hammer. (a) Using a screwdriver, install a new bearing bracket hole snap ring. NOTICE: Do not damage the oil seal and boot. (a) Coat the spline of the inboard joint shaft assy RH with gear oil. (b) Align the shaft splines and install the drive shaft assy RH with the 2 bolts. NOTICE: Do not damage the oil seal, boot and dust cover. NOTICE: Be careful not to damage the outboard joint boot. (a) Install the lower ball joint to the front suspension arm subassy lower with the bolt and nuts. (a) Install the tie rod end to the steering knuckle with the nut. (a) Install the speed sensor to the steering knuckle with the bolt. (b) Install the flexible hose and the speed sensor to the shock absorber with the bolt and set the clip of the sensor on the knuckle. Do not twist the sensor wire when installing the speed sensor. (a) Install the stabilizer link assy LH with the nut. (a) Using a socket wrench (30 mm), install a new axle hub LH nut. (b) Using a chisel and a hammer, stake the axle hub LH nut. HINT: Perform the procedure only when installing the RH side.